Korilakkuma telegram! | Angel's Rilakkuma Blog! Korilakkuma joins Rilakkuma in Rakuten’s stuffed telegram service!! 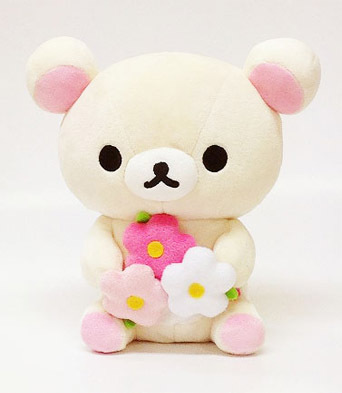 Already available for purchase is Rilakkuma with flowers, a cake, and a heart bouquet – and now Ko-chan is available to celebrate weddings, birthdays, or maybe a new promotion at work! She looks really sweet with her flowers, I would love to find her sitting on my desk – what a beautiful surprise! …now I know the Kiiroitori lovers out there are going to say Kii never gets any love – well check this out, Kii playing the piano is the #1 seller in the San-X net shop! This entry was posted in Uncategorized and tagged Cake, gift, Home, Japan, kawaii, kiiroitori, korilakkuma, plushie, Rakuten, rilakkuma, san-x, stuffed animal, telegram, Tokyo, wonderland by Angel. Bookmark the permalink.